Exhibition preview. Photography by Jacquetta Clark. Since the 1970s, Ulay has gained international recognition for his experimentation in photography and action works, and his ground-breaking collaborative works with Marina Abramovi?. Situated at the intersection of photography, performance and critical interventions, Ulay’s unique artistic practice examines the physical, emotional and ethical limits of the individual and gendered self, whilst affirming ‘the social’ as the primary means of ascribing meaning to everyday life. Pioneering the use of Polaroid photography in the 1970s, Ulay interrogated the body and its appearance to the other through “performative photography”. In Pa’Ulay (1973-74), part of the Renais Sense series, Ulay joins his face to that of his then partner, Paula Françoise-Piso. A seminal example of his highly celebrated Auto-Polaroids, the combination of his own body with the body parts of others produces images with an urgency keyed by their medium, the Polaroid. Ulay, Renais sense Aphorism, 1972 – 1975 (1973). 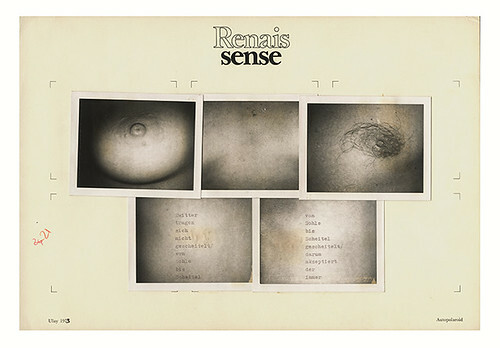 From the series Renais sense. Expanding this question of identity and its ethics, so you see me features a film of Ulay’s legendary work There is a Criminal Touch to Art, a 30-hour live action performed in Berlin in 1976. By stealing a symbol of the ‘German soul’, Carl Spitzweg’s painting The Poor Poet, and hanging it in a Turkish family’s living room, Ulay’s concern with this incredible work was to make people aware of the difficult situation for immigrants in Germany. The politics of There is a Criminal Touch to Art are reiterated in works from the 1990s included in the exhibition; Fortress Europe, Kill Your Pillow (1992)*, Women with Flags (1992-1997) and Bread and Butter (1993), which are part of Ulay’s “Social Experiment” series. 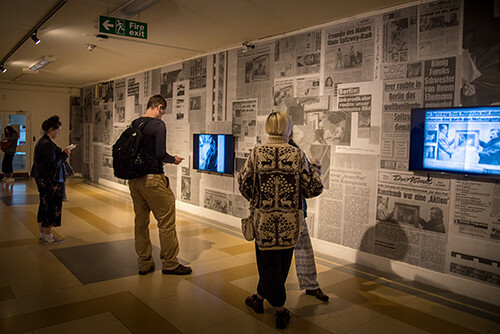 Operating as critiques of the European Union, specifically its eastward expansion in the 1990s, these works created participatory platforms that sought ethical reactions from audiences to the realities of isolation and discrimination experienced by immigrants, the homeless and those on the margins of society. Given the current political instabilities Fortress Europe, Kill Your Pillow is a prescient work whose method and ethical focus remains strikingly cogent in 2017. Tim Brennan and Others, W139 Amsterdam. Courtesy of Ulay Foundation. Underscoring Ulay’s works is a striking relationship with language defined in his work Aphorisms (1970-73), a series of two hundred collage and concrete poetry works. Derived from this extraordinary body of work, Ulay has created a new sound installation for this exhibition. Consisting of twelve pieces of Aphorisms and a monologue by Ulay, this new work expresses the essence of So you see me; an abiding concern with ethics, identity and resistance. Ulay is the pseudonym of Frank Uwe Laysiepen. He was born in 1943 in Solingen, Germany. Ulay was formally trained as a photographer, and between 1968 and 1971, he worked extensively as a consultant for Polaroid. In the early period of his artistic activity (1968-1976) he undertook a thematic search for understandings of the notions of identity and the body on both the personal and communal levels, mainly through series of Polaroid photographs, aphorisms and intimate performances. At that time, Ulay's photographic approach was becoming increasingly performative and resulted in performative photography (Fototot, 1976). 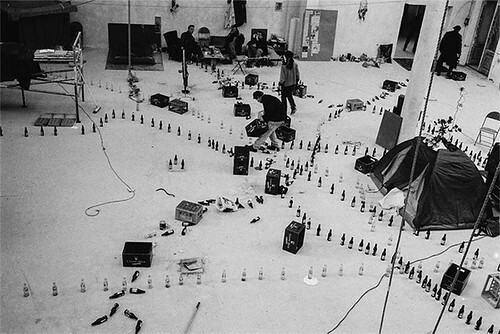 In the late stage of his early work, performative tendencies within the medium of photography were transformed completely into the medium of performance and actions (There Is a Criminal Touch to Art, 1976). From 1976 to 1988, he collaborated with Marina Abramovi? on numerous performances; their work focused on questioning perceived masculine and feminine traits and pushing the physical limits of the body (Relation Works). After the break with Marina, Ulay focused on photography, addressing the position of the marginalised individual in contemporary society and re-examining the problem of nationalism and its symbols (Berlin Afterimages, 1994-1995). 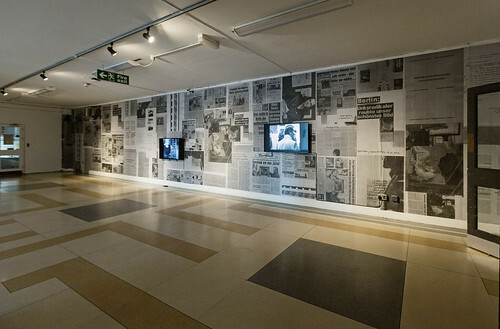 Nevertheless, although he was working primarily in photography, he remained connected to the question of the 'performative', which resulted in his constant 'provocation' of audiences through the realisation of numerous performances, workshops and lecture-performances. In recent years, Ulay is mostly engaged in projects and artistic initiatives that raise awareness, enhance understanding and appreciation of, and respect for, water (Earth Water Catalogue, 2012). Ulay's work, as well as his collaborative work with Marina Abramovi?, is featured in many collections of major art institutions around the world such as: Stedejlik Museum Amsterdam; Centre Pompidou Paris and Museum of Modern Art New York. After four decades of living and working in Amsterdam, several long-term artistic projects in India, Australia and China, and a professorship of Performance and New Media Art at the Staatliche Hochschule für Gestaltung, Karlsruhe in Germany, Ulay currently lives and works in Amsterdam and Ljubljana, Slovenia. 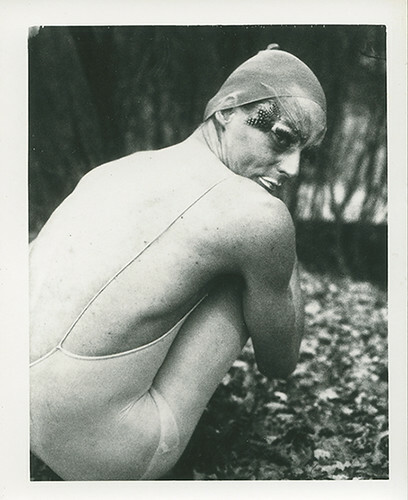 Ulay, Elf, 1974 From the series Renais sense, Auto – Polaroid type 107. On the occasion of Ulay: so you see me, four artists/writers, Jude Browning, Amelia Bywater, Seán Elder and Kirsty Hendry have been invited to respond to Ulay’s distinct and varied practice by producing a new text-based work. Their work will be presented live at the International Symposium and feature on Cooper Gallery’s Group Critical Writing website, a space that advocates for experimental, radical and critical writing about arts and culture in Scotland and beyond. To read the artists' Commissioned Responses on Group Critical Writing click here. 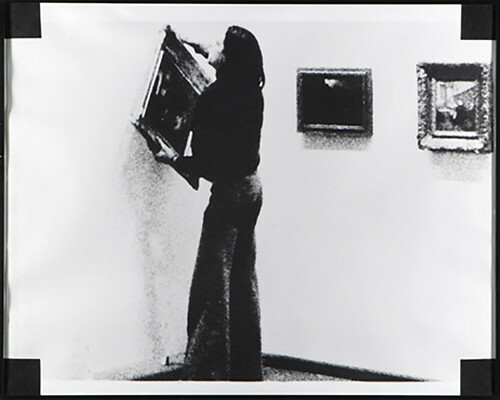 Header Images: Ulay, S’he, 1973/74. Polaroid type 108. 10.4x8.7 cm. Courtesy Staedel Museum, Frankfurt. Cooper Gallery would like to thank Amelia Jones, Dominic Johnson and Tevž Logar for their support in the research and development of this project and REWIND for digitising Ulay's video works. This exhibition is kindly supported by The National Lottery through Creative Scotland, and The Goethe Institute.